The disconnect is only superficially due to politics, though this does play an important role. The real difference needs be told, one separate from the other. The reason is that the disconnect has different roots in each sphere. The first thing which needs to be admitted is that the Jews in the United States are not all left wing, progressives belonging to the Democrat Party. There are a number of Republican Jews who are conservative in the United States who pale in numbers compared with the liberal Jewish establishment. There are leftist Jews in Israel who are of a sizable presence largely centered around Tel Aviv and most of the remainder in Jerusalem. This is not to claim that there are none in our little corner, we have some dear friends who hold leftist views. What is amazing is that though leftist Israeli Jews probably agree with their fellow liberal Jews in the United States on most social issues, they differ when it comes to the anti-Israel and anti-Zionist leftist radical in the United States. The conservative minority in the United States is more closely aligned with the conservative Jews in Israel with few exceptions beyond some religious perceptions about Israel and whether she should have waited for the Messiach to come and found the new Jewish State (there are some Jews in Israel who actually agree with this sentiment). This article will be dealing largely with the liberal and leftist Jews in the United States as they are the majority and the nationalist-conservative Jews in Israel as they are also the majority (though not by as great a percentage though that is changing). The first thing is evidenced on numerous college and university campuses where young Jews protest Israel and tout the Arab Palestinian mantras all of which are calls for the destruction of Israel as the Jewish State. There are numerous American Jews who would need to be pushed forcefully before they would ever consider making Aliyah and moving to Israel. They believe that the United States is the new “Promised Land” and that Israel is simply a quaint little nation which is nice but not really anything central to their lives. This is a fiction which has infected the Jews time and time again throughout the ages. The Jews are a people whose desire to find perfection of the human society which often leads them astray. The Jews are often at the forefront of new ideas, be they societal or political and, as both things go through cycles, they often are treading on ground which was traveled before and ended with the same tragedy which their new great hope will eventually reach. Perhaps some bit of an explanation with recorded historical realities will make this more clear. Everyone has probably heard the Exodus story about how the Jews were led by Moses from slavery in Egypt to the Promised Land of what is today Israel. What was likely left out of the telling is that not all the Jews left Egypt with Moses. Jewish oral history notes that approximately twenty-percent of the Jews left Goshen and Egyptian rule to take what must have seemed to be a perilous trek across the desert and through numerous lands each with their own peril. The greater majority chose to remain in Egypt where food was plentiful, their days were ordered by their Egyptian rulers, and they had few decisions or responsibilities for leading their own lives. Further, Egypt, for them, was the great empire which would last forever and was the future and the easier road to salvation. One may ask what ever happened to those Jews who remained in Egypt. They assimilated and were never hear from again. Those Jews who do not heed Hashem’s call to follow the proper path will find themselves cutoff from their brothers and sisters only to perish from the history of the Jewish People. Even those who left Egypt with Moses did not all take the entire journey to the Promised Land and skipped the forty years in the desert. We know this as there has been Jewish styled artifacts found in the Greek Isles along with other items from periods well before Alexander the Great unified the Grecian city-states. These artifacts even predated the First Temple. Those who went with Moses are the lineage of the modern Jews. After reaching the Holy Lands, the Jews had a long and fruitful number of centuries before there came a divide over who was the rightful heir to the throne after King Solomon. The kingdom split and became the northern Kingdom of Israel consisting of ten tribes and their priesthood and the Kingdom of Judea which consisted of two tribes and their priesthood. The northern kingdom was conquered by the Assyrians and was lost until modern times and was referred to as the ten lost tribes of Israel. 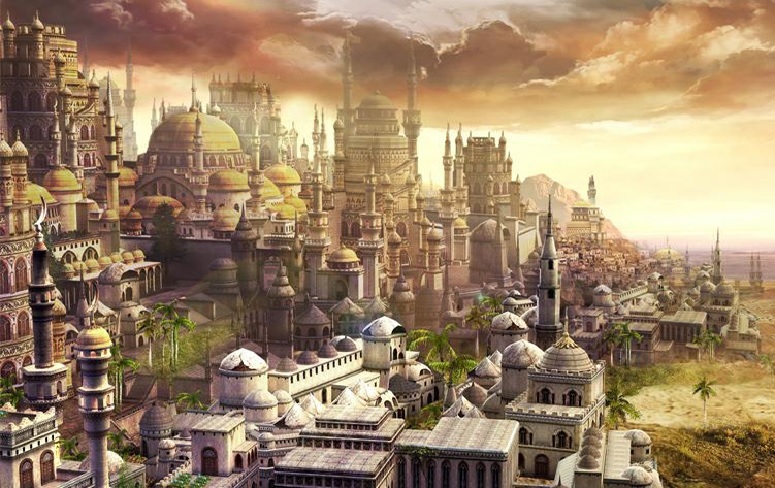 The southern kingdom of Judea was eventually conquered by the Babylonians. The Babylonians fell to the Persian Empire led by Cyrus the Great who allowed the Jews to return to the Promised Land and were told to rebuild their Temple. Once more we are told that a mere twenty-percent of the Jews returned with the remainder enamored with the greatness of Persia. These Jews were all but assimilated believing that Persia was the entire future of humankind. These Jews got a reality check from which we get the story of Purim. Hamas convinced the king that the Jews were disloyal and supported their kingdom over his rule. The king ordered that the Jews be exterminated only to find out his queen was a Jewess. The king them allowed the Jews to defend themselves on the ordered day for their extermination and the Jews prevailed. Still, these Jews did not all immediately pick up and head for Jerusalem. A mere pittance, a remnant, chose to return to the Promised Land. Persia fell and on came Alexander the Great and the Greek Empire. Once again, there were a large percentage of the Jews living in the Promised Land who were mystified by the Greeks and their philosophy. These Jews were referred to as Hellenistic Jews though their attachment to Judaism was far from perfect. Many Jews became so overcome by the Greeks and they believed that this was the end of history and surely the Greek Empire would rule the world. Well, then came Rome and the Roman Empire with its glory and wealth and again Jews left their faith in the belief that this must surely be the new age which would last eternally. These Jews disappeared when Rome fell or held out until Byzantium fell. The Jews who have remained loyal to their faith, as well as any other Jews the Romans felt were undesirable, were dispersed throughout the Roman Empire with some sold into slavery to peoples outside of the empire. This was largely responsible for the Jews ending up spread throughout Europe, the Middle East and Northern Africa. Here again, the Jews ended up split into two separate groups each with their own difficulties. Many are very familiar with the trial and tribulations faced by the Jews across Europe and Russia. They faced pogroms, forced conversions, inquisitions, purifications and expulsions often sending them almost all the way across Europe seeking a safe refuge to restart their lives. The Jews who lived in the Middle East and North Africa (MENA) were soon ruled by the Caliphate as the Islamic Empire spread across the MENA region. These Jews also faced persecution which is seldom recorded in history as the European historians accepted what they were told by the Muslims as the reality and that everybody lived in peace and harmony. 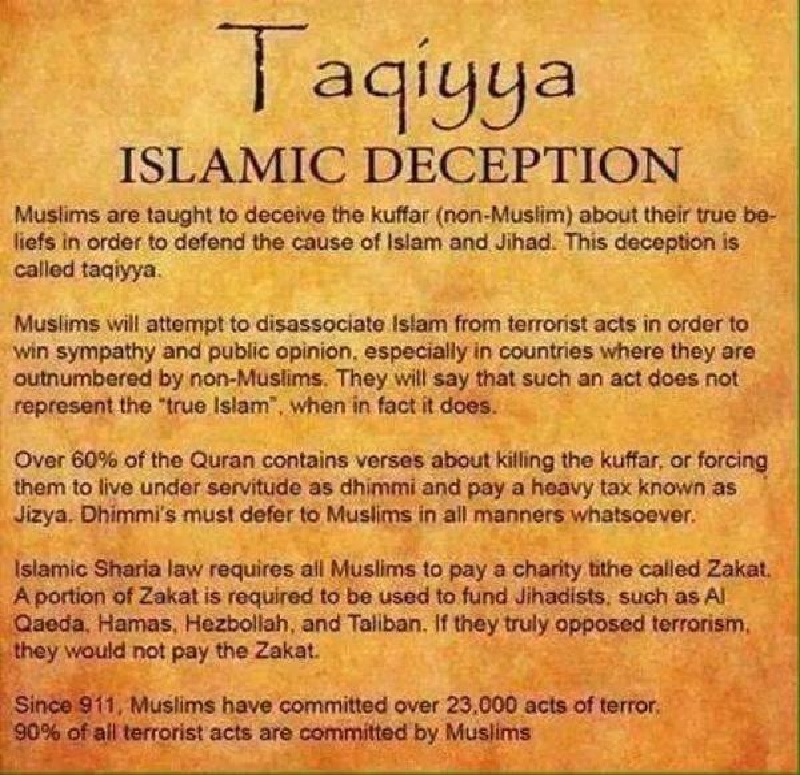 This is what is referred to as Taqiyya. Jews under Islamic rule, same as Christians, were persecuted and faced forced conversions. Whenever things went awry and times were difficult, whether in Europe or under Islamic rule, the Jews were often the scapegoat and faced threats to their existence often resulting in mass executions. Such times could be economic, a plague, famine, floods or any calamity whether manmade or natural. The difficulties faced by these Jews resulted in many converting both under duress and by choice seeking to improve their lives. Even after conversion, former Jews were watched with suspicion that they were secretly practicing Judaism, and some actually were such as the Moranos of Spain during the Inquisition. The Jews residing in the region of MENA faced the perils of the Islamic and later the Ottoman Empires with the additional challenges Jews faced virtually everywhere on the globe. The Jews of Europe spread to the New World along with their respective countries as they established colonies. This simply served to spread the Jews even further around the world. Back in Europe, the Jews faced new threats and found new saving ideas and movements which they joined often with great hopes. One such cause was Communism which a number of Jews supported believing the ideals of community and shared property would bring equality and they expected acceptance. That was short lived as Stalin would enact numerous laws which victimized Jews and the Soviet Pogroms were just as horrific as were the pogroms under the Czars. The one deception which can be attributed to the Czars was the Protocols of the Elders of Zion. What was one of the most damning things about the purges of Jews by Stalin and the Holocaust by the Nazis was the fact that Stalin blamed the Jews for the rise of fascism while Hitler blamed the rise of Communism on the Jews. Often, when looking at Jewish history, it is a story of damned if you do and damned if you don’t. Also as part of the Jewish history in Europe, it included being forced from the British Isles, the Spanish Inquisition, the purification of France and of Italy and numerous other persecutions by one nation after another. The Jews were blamed for the plague, droughts, economic difficulties and even for practicing the only trades they were permitted, as most European nations forbid Jews owning land as land equaled wealth. The main profession other than trades of smithing, tailoring, butchering and the like, was exchanging money and allowing for trade outside of bartering as well as providing capital for investing. They were accused of usury often when a person of prominence was unable to repay their loan and decided that the solution was to blame the Jew who lent them the capital as having the Jew killed or run out of town freed them from their debt, read the Merchant of Venice written by William Shakespeare who wrote the tale in a period while Jews were barred from Britain. The truth is that for the most part, the Jews never saw their lives in Europe or across MENA as living in the age which was the end of history and capable of ruling the world and accepting them. This brings us to the New World and in particular, the United States. Many American Jews believe, as their forefathers had mistakenly believed before them, that the United States was the future and the new Promised Land. This did have periods of difficulty but the United States despite not fully accepting the Jews until most recently, still allowed the Jews to enjoy all the freedoms and opportunities, even if some businesses refused to hire Jews. There was that brief but traumatic episode with General Grant and his General Order No. 11 (1862) which ordered the expulsion of all Jews in his military district, comprising areas of Tennessee, Mississippi, and Kentucky. General Grant laid the blame for black market activity, largely regarding cotton, on the Jews and ordered their expulsion and the confiscation of their lands and properties. The order was rescinded by President Lincoln, but not before most of the damage was done. After the Civil Rights movement gained equal rights for minorities, the Jews became convinced that at long last they had found the new age and the perfect land where they could remain and live in perfection. There have been some number of American Jews who have made Aliyah and live in Israel, probably well under twenty-percent which has historically been the norm. The Jews were not alone this time in their belief the time for the end of history has arrived. Francis Fukuyama, an American political and economic scientist, wrote a book titled, “The End of History and the Last Man” after the fall of the Soviet Union claiming that war and human conflict were not likely in the future as Capitalism had proven superior and there were no future discordances as all the important and potential for conflict had reached their definitive solution. He claimed that with the fall of Communism and the Soviet Union and the end of Fascism after World War II, all the opposition to liberal democratic capitalistic philosophy had been eliminated. Unsurprisingly, Mr. Fukuyama has reached a momentous conclusion, he has postponed the end of history. There has been a rise anti-Semitism throughout the Western World and beyond. Most of the nations within MENA expelled their Jews after the founding of Israel in protest of the founding. This may have backfired as these over three-quarters of a million Jews into Israel and their descendants make up approximately half of the Israeli population. As an aside, we have seen the mixing of the European Jews with the MENA Jews which will make Israel truly a nation of a united and unique Jewish nation. There have been genetic studies which have shown that the European Jews are genetically similar with the same genetic roots as the MENA Jews. The similarity was to such an extent that those who conducted the studies were shocked at their findings as they were expecting that these two groups which had been separated for almost two millennia would definitely have departed genetically and it was next to impossible. Their conclusion decided that the Jews placed such an importance at marrying within the faith, that despite their residing apart would have led to their drifting apart through intermarriage and other means which would have led to genetic differences. The remaining Jews outside of Israel now reside predominantly in Europe and North America with pockets found spread around the globe. This is why the rise in anti-Semitism is mostly relegated to these two areas as well as the few pockets. This was brought to a head with the recent blowup over the anti-Semitic tropes used by recently elected Congresswoman Ilhan Omar. Despite this extremely public display, it has had a fairly little if any effect in the American Jewish community. Many Jewish communities within the United States are, unfortunately, excessively insular where they act very much as an echo chamber which ignores much of the outside world beyond their work. This was just the apex of the rising anti-Semitism which was evidenced by rising attacks on Jews in Brooklyn in some of the most heavily Jewish areas. These attacks are simply the tip of the iceberg which is being underplayed by the American Jews as it impinges upon their belief that the United States is the Promised Land and it will be the great haven for Jews forever into the future. If only they were correct, such would make even the Jews in Israel happy, as we want only the best for all of our brethren. The one quirk is that most of the Jews in Israel also see America through rose-colored glasses thinking that it is a golden land. Apart from they are correct, that is now and we can only wonder about the future. Were this to be true, it would be the first nation in history to break the Tytler Cycle (see below) which presents the stages societies have historically followed. 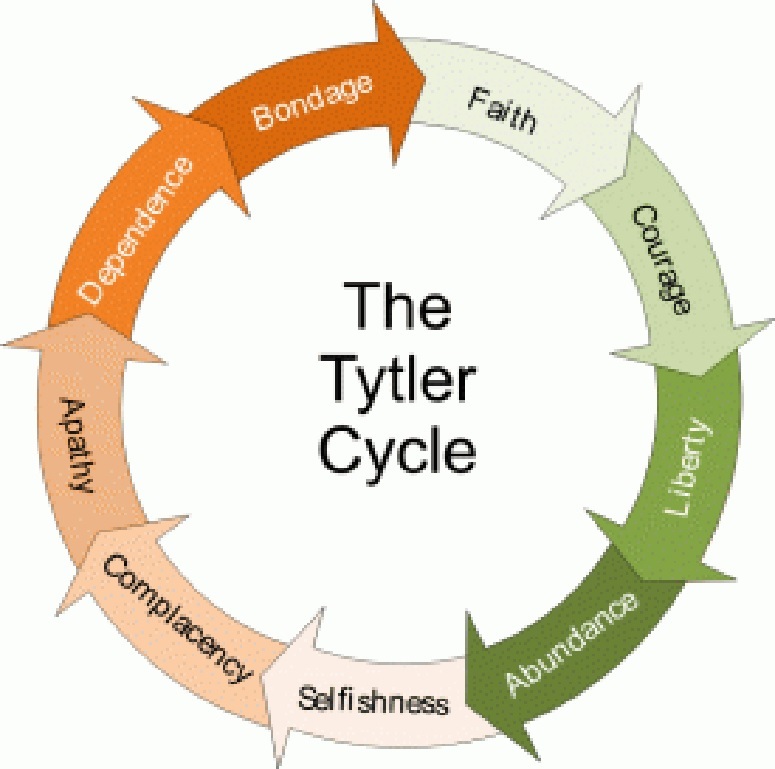 Many of the ancient societies only were able to go around this cycle once before they were overrun by the next rising empire on their initial pass around the Tytler Cycle. The Jewish people have been around this circle far too many times and should have learned, but Jews are optimists if nothing else. Well, most Jews are optimists and our editor is the exception that proves the rule. But our editor is an exception in too many ways to even list. Any in-depth study of history proves the validity thus far in human experience of the Tytler Cycle, especially with the rise and fall of the early empires, the numerous rising and collapses of China and Japan, the rise and fall of the numerous European nations with some making their way around the circle more than once. There are arguments as to where on the cycle one finds the United States. The different opinions place it anywhere from Complacency to Apathy with some claiming Dependence. Jews in Israel have a view of the United States which is probably looking at her as she was a couple of decades ago and also refuse to recognize the rising anti-Semitism. Perhaps this is a blindness which has plagued Jews over all of history which would explain to some extent why they remain in nations and do not leave at the first signs that their acceptance is crumbling before their eyes. Whatever the reason, the next decade or two will be very crucial in determining whether or not the Jews have any future in the United States. Should the political climate, especially on the left where the majority of the Jews align, continue in taking the tack which recent events may be a preview, Jews will face an end to their acceptance in the United States. This will also shock the majority of Israeli Jews who believe that the United States and Israel are attached at the hip and never to part. They believe that America has always been a staunch ally of Israel completely oblivious to the fact that the United States did not begin to support Israel militarily until the early 1970’s. We know this because we have had to prove this repeatedly. This is their corollary to the belief that Israel cannot survive without the aid provided by the United States. We discussed this in depth here. As we have predicted, the day will come, and in the not that distant a future, when the aid from the United States will cease and it will probably do so precipitously and, in the eyes of most Israelis, with little or no warning signs. That is the extent of their willful blindness. So, what are our conclusions from all of these presumed observations? This is where we often get into deep trouble. The most obvious is that America and Israel will probably go their separate ways after a messy divorce which will astonish Jews in both nations if not the entire globe. It will not be long after this that Jews start to find that they are not as welcome in many of the cities within the United States. There will be a slow but steady increase in acts of anti-Semitism in the United States only slightly lagging behind the same across Europe. Along the road to this end, the Jews will find themselves supplanted in the Democrat Party by Islamic interests. Jews will find themselves endangered on college and university campuses as one of the earlier warning signs. Synagogues will initially require guards when holding services and eventually require around the clock active protection provided by security companies who will place guards, and later armed guards, to protect them from attack. The same will occur for Jewish schools, daycares and organizational headquarters. Then their homes will come under attack and they will be advised to remove their mezuzahs from their doors for their safety as was temporarily advised for the Jews residing in the North of London or as happened in a community in San Francisco. (This article gives a summary of some of the incidents where this has occurred) With time, more American Jews will end up following their European counterparts in making Aliyah to Israel. The reality is that once the United States does turn on their Jews, other than Israel there will be no safe place to run. The world is going to spit out their Jews one region after another and the Jews in each place will be shocked and astonished with many not understanding what has happened and why they are being treated as they are. This has already struck the Jewish members of the British Labour Party despite the protestation of Jeremy Corbyn; the person one might claim is the ringmaster of the quickly rising anti-Semitism within the British left and the one facilitating the cover-up. At some point, the United States will have telegraphed the coming Jewish apocalypse when their support for Israel rapidly dries up and Israel is cast adrift by the United States. For this reason, we have advised as many as we are able to reach that Israel must begin to produce her own armaments, aircraft, ships, submarines and all other military equipment as she will soon find herself without any true friends. We realize that between nations there is no such thing as friends, simply nations with shared interests which are always subject to change. Israel is going to find that these shared interests are going to be changing and doing so rather fast unless the world takes a turn and alters its current trajectory. This coming alteration in the world and its alignments is a subject which we are likely to come back to from time to time with an ever-greater urgency as we see the approaching tipping point. Currently, this point is outside of our vision but the warning signs are so evident that its inevitability unfortunately appears to be unavoidable. Many Israeli and American Jews will be shocked by the progressing events and will refuse to believe those who predict them. Just as Jews were late in fleeing the Nazis, the Spanish Inquisition, the edict in Persia, the pogroms under the Czar and the purges under Stalin in Russia and so many other periods and times when they could have avoided torture, dispossession, expulsion and death, so will they remain in denial across Europe and in the United States and elsewhere never believing it could happen here. This was the response which Ze’ev Jabotinsky met when he warned the Jews in Eastern Europe that they needed to leave and move to the Promised Land even if they had to walk the entire way when he visited in the early 1930’s. This has been the reaction we have received from Jews we spoke with about this in the United States before we came to Israel and was also the reaction we received from our gentile friends. There is one gentleman with whom we are in steady contact who also denied what was coming and has told us, “You were right again and why don’t I ever believe you about these things.” We have faith he will learn before it is too late. We just hope that the Jews in the various regions, as they turn ugly, realize in time to safely relocate and return home to Israel. One last cautionary note, even after virtually every Jew has left the world and returned to Israel, Israel will still be the nation most scorned and regularly condemned by the United Nations, its various agencies and the vast majority of the nations on the planet despite her continuing to share her advancements, discoveries, innovations, medical procedures, computing software and the other various areas where Israel is one of the leading nations in such improvements. Hamas once again provided proof of their intent to destroy Israel one home at a time if necessary. The escalation recently includes two rockets fired at Tel Aviv just over ten days ago. Prime Minister Netanyahu ordered a responsive strike on Hamas and Islamic Jihad targets in Gaza. These strikes by the Israeli Air Force were the usual empty buildings which have been hit before again and again in the name of responding to attacks from Gaza. Some in Israel have begun to refer to these bombings of empty building as the line from the movie Casablanca after Rick shoots the Nazi Commissioner, “Round up the usual suspects.” The bombing of empty buildings has become a farce even within Israel and the reaction of shock by the Europeans reminds us of another scene from Casablanca when it is “discovered” that there is gambling in Ricks bar/casino and the chief gendarme exclaims, “I’m shocked, shocked” and many people like to add “I tell you,” but that is not in the movie. We promise, no more quotes from Casablanca. The rocket attack on Tel Aviv, according to Hamas, was an unfortunate accident and never intended and they plan to conduct an investigation into the firing. This explanation was mostly accepted by spokespeople in Israel, much to everyone’s amazement. That was just over ten days ago, so enjoy the two clips and we will talk about the latest attack afterwards. This past Sunday, Hamas once again had an unfortunate accident once more, but this time the results were nothing short of a miracle that nobody was killed. This “accidental” rocket firing also went deeply into Israel, close to fifty miles from the Gaza border. 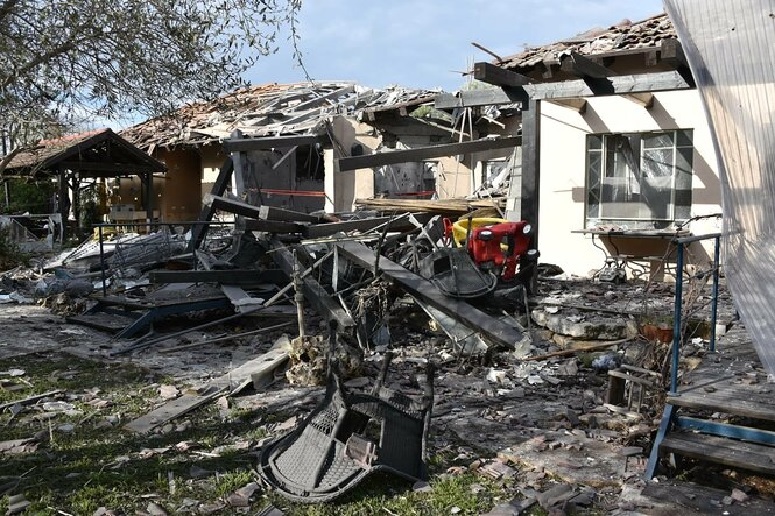 The rocket landed in the Sharon region and struck the house of a sixty-year-old woman whose extended family was apparently visiting or live with her. It was reported by Magen David Adom that seven people were injured, the a sixty-year-old woman who is in moderate condition suffered shrapnel wounds and burns, while a thirty-year-old woman who is in moderate condition suffered shrapnel wounds and five people who were lightly injured including two infants. Several others were treated for shock, as often is the case when high explosives detonate within your neighborhood. 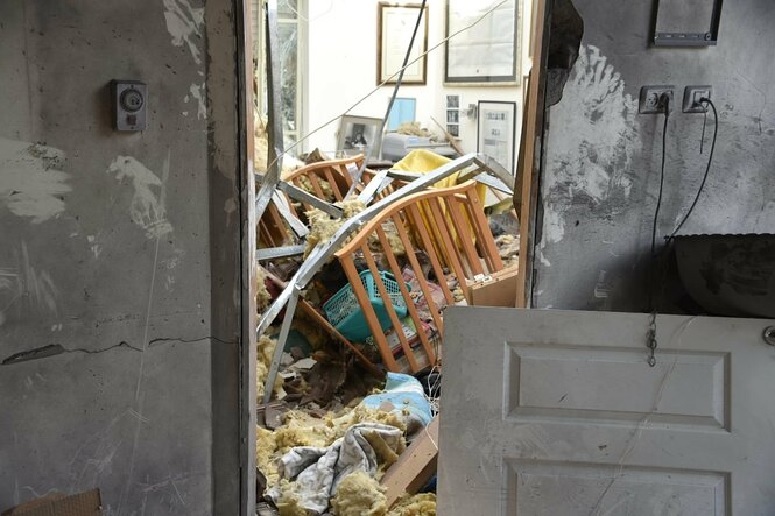 The house which was struck was completely destroyed and looking at the photos it becomes apparent that it really was a miracle nobody was killed. Below are two pictures taken from this report which contains videos and more pictures for those desiring to see additional footage. The second picture shows a crib which we assume was where the infants were when the house was struck. The excuse that the rockets were fired accidentally, or they were fired without being authorized, neither argument makes those residing in destroyed buildings who survived solely because of a miracle not have grievous injuries or those whose nerves were shattered feel an calmer than if these had been authorized and intentional attacks. The truth of the matter is these were intentional attacks by whomever built the rocket, those who fashioned the explosive warheads, the ones who constructed the launchers and the individuals who launched the rockets all doing their part in an intentional attack intending to murder as many civilians as possible. By allowing such an excuse to basically stand, all that is accomplished is guaranteeing that there will be dozens of “unintended” rockets fired at targets in Israel and then soon there will be hundreds of “accidental” firings of rockets a week and then that number will become daily. Israelis have watched this song and dance before and realize that every rocket is fired with malice aforethought and with the full intent of causing as much harm, death, destruction and shock amongst whatever else these strikes may cause only to increase steadily until Israel responds with force. They also know what comes next. The entire escalation by Hamas, despite their plaintive excuses, is a response to the lack of Israeli push-back over the border rioting which has been continuous over the past year. Yes, we said continuous over an entire year and showing no sign of letting up. The rocket firings only serve to show that things are about to get out of hand. Last week or so ago, while meeting with Egyptians trying to mediate a cessation of the border hostility, Hamas promised to end the border rioting yet it was while they were meeting that the two rockets were fired at Tel Aviv. There were two other rockets fired at the same time with one heading out into the Mediterranean and the other did not clear Gaza falling inside their area. Hamas convinced the Egyptians that they had nothing to do with the rockets fired as they could not be suspect of firing rockets while meeting with the Egyptian mediators. Who ever thought that this statement had the slightest measure of validity obviously knows little or nothing about Hamas and their terroristic duplicity. Of course they would pick such a time to fire rockets at Tel Aviv knowing that Israel would not respond as long as the Egyptian mediators were meeting inside Gaza. Israel has fallen victim of timidity due to the desire for acceptance by the world. The idea was that as long as the damage caused by the rioting on the border was limited to closely within the border area, then it was tolerable and the powers that be decided that it was not worth responding and getting the European Union (EU), United Nations (UN), numerous anti-Israel NGO’s or those in the United States who desire that Israel not cause them any distress all up in arms about disproportionate responses. This was even more important right before the AIPAC convention where too many still believe that two states for two peoples living side-by-side in peace and security is the proper and viable solution if only the two sides could agree on borders. This would also be important so that when the Israeli Prime Minister and others from Israel spoke, they would be well received and there would be no cause for uncomfortable questions from those who always claim to side with Israel while all-too-often condemning Israeli actions as being disproportional. Let’s discuss this disproportionality utter ridiculousness. Firstly, in our discussion, let us take a tally of World War II deaths by nation on each side. Looking at the Iraq War which removed Saddam Hussein from power, the allies with the United States suffered less than four-hundred deaths while the dead for the army of Iraq suffered an estimated fifty-thousand to many hundreds of thousands as well as approximately one-hundred-thousand civilian deaths. On the eastern front of World War II the Axis Powers suffered slightly over five-million dead while the Soviet Union suffered just under ten-million killed. World War II on the western front had the Allied Powers suffering three-million dead while the Axis Powers suffered over five-million dead. The War in the Pacific has two sets of casualties which have a very telling story behind them. As far as military deaths are concerned, Japan suffered over two and one half million dead while the Allies suffered four-million plus dead. Civilian deaths tell a horrid story with Japan suffering just over one-million deaths and their victims suffering somewhere over twenty-six-million deaths. One might wonder why such a disproportional difference in the civilian deaths between Japan, who had two entire cities wiped from the map by the two nuclear bombs dropped ending the war, while they inflicted such a horrendous toll against the civilians of the regions they conquered before being defeated. The reason is very simple; the Japanese troops butchered and murdered Chinese civilians in excessively large numbers simply out of their racial hatreds of the Chinese and a form of revenge for the wars fought between the two adversaries over their long histories. The one item which is apparent from these numbers, and are true of every war, one side always suffers more deaths and other casualties than the other side. Throughout history, if one were to plot the deaths of all the wars, it would become apparent that more often than not, the side which loses has the higher casualty numbers than does their victors. In ancient history this is very true as often the side that won the conflict either took the vanquished as slaves or simply slaughtered their adversaries entirely. This made the difference between the two sides far more disproportional. The casualties in war are always going to be disproportional as each side attempts to kill as many of their enemy as possible and by whatever means they have at their disposal. It has only been since the advent of nuclear weaponry that sides in a conflict limited what weapons they used avoiding exchanging in a nuclear Armageddon. There is one foreboding reality which need be of great concern; there has never in all of human history been a weapon invented which did not become the weapon of choice in a future war. Thus far in human history, nuclear weapons have been the exception such that after the two, rather small by todays weapons, nuclear bombs were dropped on Hiroshima and Nagasaki, there has not been another nuclear weapon used in any conflict, and allow us to emphasize, Yet! That yet at the end of the last paragraph should stand as a warning. There are nations now developing or already possessing nuclear weapons which do not fear their use. They know of the devastation and suffering caused by the bombs which were dropped on Japan and they see this as an invitation for placing their enemies on their knees or worse. Iranian military and civilian leaders and spokespeople have often referred to Israel as a one or two bomb nation. Such commentary cannot be referencing any non-nuclear weapons currently existing. This reference can only mean using nuclear weaponry, and Iran is one of those nations who saw what damage was done to Hiroshima and Nagasaki and think of this as an invitation for using nuclear weapons and not a warning against their use. They are not even concerned over any potential Israeli retaliation, even an Israeli nuclear response. The Ayatollah has stated that he would willingly sacrifice all of Iran if doing so would eliminate Israel. This threat should frighten any logical thinking person, but the world simply goes along with the Europeans trading feverishly with Iran because there are Euros to be made and Iran is still flush with dollars provided by the United States as an enticement for Iran to join in a treaty which simply was presumed to push their developing nuclear weapons and building an arsenal by eight to ten years. That was simply kicking the can down the road leaving the threat for the next President or the one after and all but guaranteeing that Iran would be a nuclear-armed nation by the end of the ten years. If you are counting, that would be in about another seven and a half years. We are willing to go beyond these visions of a world which is not going to explode soon and warn that there is but a slim chance that Iran does not already have not only the plans for building nuclear weapons or simply many of the components to build thermonuclear weapons, the really big bombs, or simply the technology to miniaturize nuclear weapons for use in warheads atop ballistic missiles, but that Iran has already built at least fifty thermonuclear warheads and has them ready to be placed atop their ballistic missiles and use them, the question being how they would employ them. Many scenarios have them launching these weapons at Israel which would require their using all or the majority of these warheads if their hope is to pierce the Israeli anti-missile systems. Fortunately Israel has a layered interception set of systems such that these weapons can intercept incoming missiles at different places on their trajectory. The other most favored scenario has the Iranians using one or more weapons as EMP devices over the United States destroying their electrical grid and simultaneously using a nuclear weapon against the American fleet off their shores in the Arabian Sea. We pray that Iran manages to replace their leadership with people far less fanatical and definitely with greater sanity. As for Hamas, Islamic Jihad and, according to certain estimates, the Islamic State, all of which are presumably operating in Gaza, should they continue to allow rockets to be fired into Israel, even willy nilly, as they would like Israeli leaders to believe, their will be a point where Israel will provide an excellent example of disproportional casualties. Israel is one of the few, if not only, nations to have ever gone Biblical on their enemies. The Israeli people are growing tired of the menace in the south and equally anxious over the enemies in Lebanon and Syria all, like Hamas, Islamic Jihad and friends, under the control of Iran and doing the bidding of the Mullahs. Hamas and friends need to know that there are a growing number of Israelis who do not care or even concern themselves in the slightest as to what the EU, UN, NGO’s and the rest of the world’s busybodies think or might say when Israel defends herself. Should Israel continue to be pushed and threatened, the reaction at some point will be intended to be highly disproportional and they will not care. In Israel, we look at these threats as real intents to destroy our little piece of Heaven on Earth and this does not please us in the slightest. We do not desire to have war under almost any circumstances, but when there are those who are making a real effort to destroy your nation and kill almost everybody residing within your borders, please do not tell us not to take it personally. Such a request is well beyond its use-by date as it applied way back in the 1960’s and even the 1970’s but does not make sense for the world as it is today. Europe may be on the verge of committing suicide by immigration and the United States has many who appear to be emerging from the dark side, but we in Israel simply wish to help those we can, live and share with those who wish to do so, and for those who wish us dead, well two can play that game and you really do not want to go there. Live with us in peace and it will result in a mutual advantage in which we will share what we discover in the many various fields in which Israel has endeavors. But desire to destroy us and then we will have a problem which will not end well, yes, potentially mutually not end well, but we can guarantee that it will not end well for our opponents. Simply look at history and the empires and nations which desired the destruction of the Jewish People, the destruction of Israel, and where are they today. Allow us to list just a few of them from across history and perhaps you will get an idea of what the future holds for those bent on our destruction. These former entities which believed they would wipe us from the face of the Earth and make us at most a footnote in history consist of Pharaohs’ Egypt, Philistines, Assyrian Empire, Babylonian Empire, Persian Empire, Greek Empire, Roman Empire (and they gave it their best just as they had the Carthaginians), Byzantine Empire, Caliphate, Ottoman Empire, Spanish Inquisition, Nazi Germany and the Soviet Union. This list has some of the former greats of history, but they are former greats and we are still here and making great strides as we have throughout history. Perhaps Mark Twain (Samuel Clemens) defined the Jews best and more succinctly than anybody else with his essay “Concerning the Jew,” which we will sign off with it below. Backing the presented plight of the Palestinian Arabs, people need to think about a few other points as well. First, you have to understand that the Arab Palestinians, backed by the oil wealth of the Gulf States, present a propaganda front backed by now approaching billions of dollars in the past two decades plus. People ask why Israel does not answer and present her side. Well, first, Israel does not have the wealth required to equal the propaganda aired against her. Israel is required to remain on close to war footing at all times with the threats on her every border and this takes much of the money which could be used to counter the propaganda, but then there might not be an Israel to save. 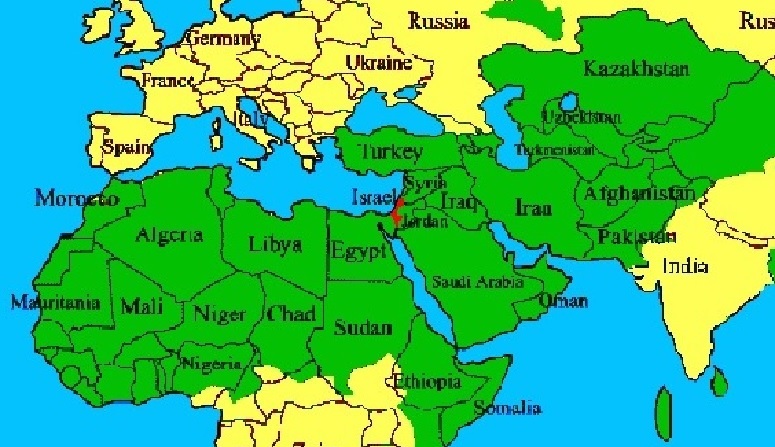 Further, all one need do is look at a map showing the Arab world and Israel and we will even provide that map below. That will also tell you something about the propaganda that Israel threatens the Arab world. That will also put in doubt the claim that the Jews are using Israel to destroy the Islamic World. There are almost, if not, two-billion Muslims in the world while the total number of Jews is approaching fifteen-million. That is approximately one-hundred-twenty Muslims per Jew on planet Earth. Another item is that both the League of Nations and the United Nations gave their blessings after the Arab League refused to any compromise on their position, which is the Jews must be ruled by the Muslims because the Quran instructs that the Jews are a lesser people to the superior Muslims, to the original promise made under the San Remo Conference that Israel was to be bordered on the east by the Jordan River. The initial idea was that the Jewish State would have occupied all of what is Israel and Jordan but the British insisted that they promised the sons of King Faisal their own kingdoms, these were Iraq and Jordan, so they divided the British Mandate evenly between the Jews and the Arabs, Jordan received 78% of the British Mandate, the lands east of the Jordan River, and the Jews received 22% represented by the lands west of the Jordan River. When the Arabs claim that all they desire is their 22% which most Western World sources interpret to mean Gaza and West Bank (Shomron or Judea and Samaria), when in actuality they mean the 22% of the British Mandate which is not Jordan, they mean all of Israel. The reason that Yasser Arafat and Mahmoud Abbas have refused every peace offer has been because they provide for there to be a Jewish State, an Israel, and not the Arabs doing as they please with the Jews. That is the reality. The Arabs do not hide their desire and intents. They have often called for the death of every Jewish Israeli. Hamas has in their charter a call to murder every Jew. Their intent is to complete what Hitler started. One need remember that the Arab Palestinian Mufti of Jerusalem Mohammed Amin al-Husseini spent the Second World War working for and with the Nazis, sat with Hitler, met with most of the Nazis who at the Wannsee Conference decided on the Final Solution and demanded of the Nazis that they assist the Arabs with their Jew problem once they had conquered the Middle East and North Africa, with the assistance of the Arabs who the Mufti was recruiting to fight with the Nazis. This is the same Mufti Amin al-Husseini who in the first weeks of May, 1948 ordered that every Arab leave Israel and come to the safety of Jordan, Syria, Egypt or Lebanon so that the soon to be gloriously victorious Arab armies could simply invade the Zionist entity and kill every person they encountered without having to worry about killing fellow Arabs. This tells a thinking person two things. First is that it is very difficult to tell Arabs from Jews. Sure, there are some people where one would think it obvious, but you might be surprised. Second, is that most of the Palestinian Arab refugees from the 1948 Arab war attempting to annihilate Israel upon the morning of her birth left of their own free will and were not forcefully evicted from their homes and villages. When the Arab armies failed and peace, or at least an end to the active fighting, finally came over a year and half later, the Arab nations took these very same refugees which they had caused and enclosed them in camps which originally were tent cities with armed guards surrounding them with barbed wire as the Arab leaders realized that these unfortunate brothers and sisters could be used as a weapon against Israel. If nothing else, they could be used as soldiers to put at the front of any army at their next invasion, which did come in 1967 and worked out even worse than their first attempt. These are realities and truths seldom spoken of as they are called lies. Here is a link to a one-hour informative examination of the Arab Palestinian Refugee problem which does not leave either Israel or the Arab world as without some of the blame and is worth watching at least once. The reality in the Arab world is that the Palestinian Arabs, be they refugees or living under the Palestinian Authority in parts of the Shomron or under Hamas in Gaza, are seen as lower Arabs less worthy than the rest of the Arab world. Their sole use is to wield as a bludgeon against Israel. Most of the protesters one will see at the so-called pro-Palestinian protests are more against Israel and Jews than they are pro Palestinian. This can be realized when one listens to many of their slogans which are often more about destroying Israel or killing the Jews in Israel than about concern for the Palestinians. This is made obvious simply by looking at a map and realizing exactly what their chant, “From the river to the sea, Palestine must be free,” which means the eradication of Israel. That is the bottom line of their reason for Palestinians, to destroy Israel. Many at these protests have no real idea what Israel is or why the Jews would even desire to live surrounded by Arabs who wish them dead. The truth is that Israel existed and was attempted to be destroyed and the Jews along with it by numerous peoples throughout history. We have a prayer included in the Passover Seder where it states that in every generation there will be those who wish to eradicate us, it says rise against us, but there is little difference when one looks at history. The following empires of history have sought to eradicate the Jewish People, Ancient Egypt, Philistine, Assyrian, Babylonian, Persian, Greek, Roman, Byzantine, Crusader, Caliphate, Ottoman, Spain, Nazi, Soviet Union, Arab World and currently the one saying it the loudest is Iran. This list pretty much covers the history of the Hebrews who would become the Judeans from which the name Jew originates. But this region is our ancestral homeland and the only peoples who were here before the Hebrews arrived at the end of the Exodus from Egypt were the Canaanites, a people who have disappeared in history. The closest that any people came to successfully destroying the Jewish People, before the Nazis almost wiped out European Jews, were the Romans. The Romans fought three wars against only two peoples and treated both identically after defeating them for the third time; these were the Carthaginians and the Judean (Jews). In both cases they changed the name of the region, in the case of the Judean they named it with the Roman name for the Philistines and attaching it to their province of Syria naming, it Syria Palaestina. It is from this name that the British and much of the world named the area which now comprises Jordan and Israel as Palestine, which was the name of a region of the Ottoman Empire and was never an actual nation. The Romans took both the Judean (Jews) and the Carthaginians and dispersed them throughout their empire and beyond as the Roman means of eradicating bothersome peoples. This brought the end for the Carthaginians, unless anyone has found one lately, but somehow the Jews survived, and their secret was simple, the Torah was the glue which kept us a people. These are some of the realities of the situation and they deserve to be considered carefully before choosing which side to support, if either side. Supporting the Arabs would present the following problem, a very real and serious problem when one considers how nation after nation, including President Roosevelt and the United States, closed their borders to the Jews, and the British closed off allowing Jews to come to what would become Israel, during World War II. About the only nations who accepted Jews in some numbers were the Philippines, Bolivia, Dominican Republic, Switzerland, Portugal, Sweden, Spain, Shanghai, and, oddly enough, Japan; but none of these nations put much of a dent in the murder machine which was Nazi Germany as they took in a few thousand or tens of thousands leaving millions with nowhere to turn. Italy protected some Jews in their regions of conquest and Japan refused the Nazi demand that they turn the Jews in Japan over to them. All told, and this is a generous estimate, perhaps one-million Jews escaped by fleeing from the Nazi death machine. Jack Engelhard wrote of his family’s escape from Europe and eventual arrival in Canada in his best selling book, Escape from Mt. Moriah. We will simply say that their escape was not exactly a straight affair of going to Canada; it was an adventure with its share of perils. The reality is through the well financed propaganda against Israel and the lack of knowledge of history, let alone ancient history, and the Bible becoming unread by most youths, many people have forgotten or were never aware that the Jews come from exactly the location it now holds. 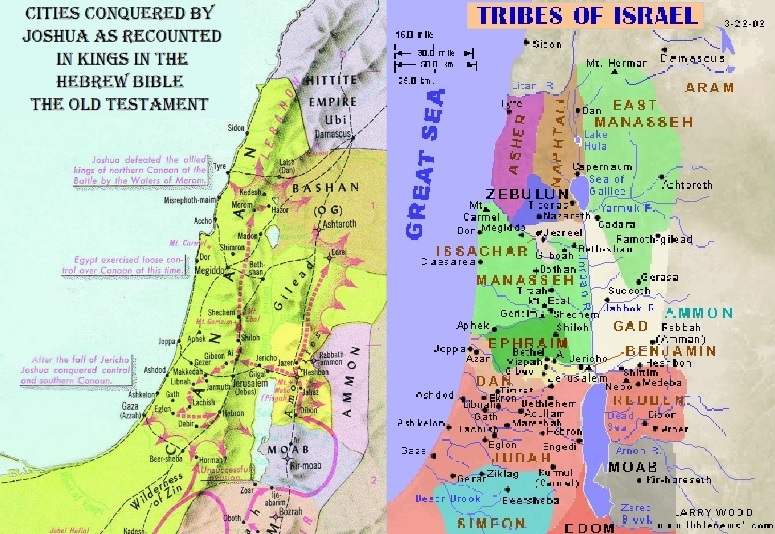 The Map below shows the routes of Joshua and the Israelites took to establish their lands and on the right is the original home of the Twelve Tribes of Israel. In the map on the right in the top right is the city of Damascus, the current capital of Syria as well as many of the cities which are today parts of Israel along the coast and throughout the tribal lands. This was the reason that the early Zionists refused the offer to grant them the Island of Madagascar simply because Madagascar is not our homeland; Israel is where we originate and where we desired to return. Torah and the Old Testament along with the numerous commentaries all promised we would return and build the Third Temple which is also called the final Temple. But if the Jews are to be stripped of their homeland, what will the world do with probably seven-million Jews. Can anybody tell me a nation which would even accept half that number? If World War II is any example, then we know the answer, a few thousand here, a few thousand there, but millions left to the mercies of the Arabs who have sworn to kill every last Jew that they are able. Even once they would have Israel, their raging desire to eliminate the Jews from the world would continue as it is commanded in the Quran, as from Sahih Muslim Book 41 Hadith 6985 stating, “Abu Huraira reported Allah’s Messenger (Peace be upon him) as saying: The last hour would not come unless the Muslims will fight against the Jews and the Muslims would kill them until the Jews would hide themselves behind a stone or a tree and a stone or a tree would say: Muslim, or the servant of Allah, there is a Jew behind me; come and kill him; but the tree Gharqad would not say, for it is the tree of the Jews.” Whatever this tree is, the Gharqad tree, we should start planting groves of them. Below, we decided to place a couple of videos of anti-Israel protests gone somewhat wrong. The first falls askance when they decide to take their protest into the diamond district of New York. What follows is remarkable. The second is quite different as the anti-Israel protest is disrupted, this time by a single young Jew armed with chutzpah and an Israeli flag. It is strange the reaction in both cases and especially when confronted by a sole sixteen-year-old young man with conviction and totally fearless. One they are overwhelmed by numbers and the second they are overwhelmed by courage, what a contrast. The obvious truth is should the Arabs ever destroy Israel, then the Jews remaining there on those final days will be slaughtered. The Palestinian Arabs and numerous Arab spokespeople have all made this evidently clear. It is a staple of the diet used to stoke protesters in the Western World, use to mollify the masses in Arab countries as well as Iran, and a staple in the Palestinian vision of their eventual return which will be over the bodies of every Israeli, by which they mean Jew though some include all Israelis with very few exceptions which would include many Arab Israelis. The obvious alternative is for the Jews to flee. Some show their lack of knowledge when they simply claim that the Jews can all return to the country they originally came from. Well, the throngs who came after the Holocaust had no nation to take them, the Jews expelled from the Arab world cannot return to Algeria, Syria, Iraq, Yemen or the many other Islamic nations which were their families’ homes in some cases for close to two-thousand-years and most of the rest for many hundreds of years, and the Jews from the Soviet Union would not likely be welcomed in Russia, same with the Ukraine and numerous European nations would be unsuitable and that leaves Canada, the United States, Central and South America and the Far East which is not exactly a place where Jews have resided in great numbers. In all honesty, within a couple of decades we doubt that the United States would even consider allowing a large number of Jews to make a new life there and the same with much of Europe. 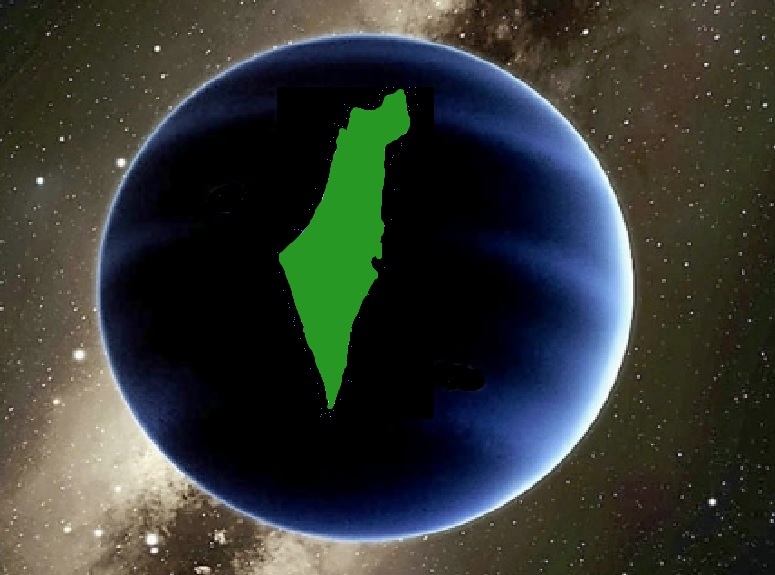 Perhaps the Jews could all climb onto a large interstellar spacecraft and head for Planet Israel. Perhaps it is actually out there. Israel is the home of the Jewish People and has been for approaching four-thousand years. Granted we were kicked out and dispersed throughout the world. We survived and we came back to claim the land which was stolen from us. The world knows that the Arabs were and are not native to the area of Israel. They originated in the Arabian Peninsula, broke out in the early Seventh Century, and spread throughout the Middle East and North Africa and into Europe from both the east and west before finally meeting a limit to what they would conquer. We saw above that Israel is not exactly threatening the Arab world or spreading and becoming a threat to all Islam. The Jews are a small minority of the world populations, approximately 0.2%, and we are not demanding a large tract of land, just our own little corner which does not even have oil. Is the world so anti-Semitic that it refuses to permit the Jews a refuge to call their own where they can simply assist nations which have had catastrophes, be they natural or man-made, invent things and share them with the world as we have done since our founding, find cures for cancer and other debilitating or fatal diseases and, most of all, study Torah and worship Hashem having a little peace at long last. Apparently, that appears to be too much to ask of this world.